The best thing about summer is the juicy, sweet and absolutely divine Mango. This is a very simple but delicious recipe to have during summer. The combination of sweet yogurt and mango with some caramelized dry fruits give an extra ordinary flavour to this recipe. This recipe is also a good source of healthy food as you can add as much dry fruits as possible and give it to your family and kids. 1. Keep the mangoes and yogurt in a refrigerator for about 1 hour. 2. Now peel the mangoes and make small scoop of mango with scooper. 3. Place the mango scoops in a plate. 4. Now take a bowl and add yogurt into it. Add all the dry spice powder, chaat masala powder, salt and 1 Tbsp sugar. Now mix everything well until yogurt becomes smooth. 5. Take a pan and heat butter. Add all the chopped dry fruits. No add 1 Tbsp sugar or more and lightly fry everything. You can caramelized the sugar first and then add dry fruits into. But it would totally depend on your taste as some may not like the caramelized dry fruits. Keep the dry fruits aside. 6. Now, it is the time to decorate the plate and serve. 7. Place the mango balls in a serving plate and make a round ring. Keep the middle of the balls empty. Now pour the yogurt mixture on the middle of the decorated mango balls. 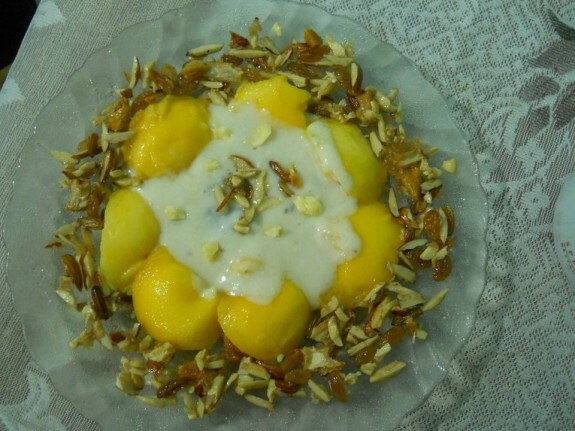 Spread the dry fruits on the top of yogurt and on the side of the plate as show in the picture.